Home to the knitting world's anti-Finisher. Kind of like the anti-Christ, but with a smaller following. Whoa, almost an entire month and no posty. That's not good. So ... a short update. I'm still not working, other than my very part time job at Green Planet Yarn. A few "extenuating" circumstances are preventing my return to work but hopefully everything will be straightened out by the end of the month. In the mean time Andy and I are having deep, philosophical discussions about the meaning of life and whether or not Fancy Feast is worth the price. He's all recovered from his little urinary tract issue and is back to hunting crickets, worms and dead leaves. I have been spending a ridiculous amount of time knitting and have a veritable parade of FO's which I don't seem inclined to post tonight. Maybe tomorrow. In other news, I have begun designing simple hats for my yarn store of employment. One of them sorta looks like this. Note to self: Don't knit samples with red yarn. And in case you'd like to make one for yourself, here be the pattern. I *think* I wrote it up correctly. It's extremely stretchy, so although you might be knitting along, thinking "This will only fit a pinhead" if it fits me (22" large head, small brain) it will probably fit you. Using circular needle, cast on 74 stitches and join in the round without twisting. Work in K1, P1 rib for 9 rounds. On round 10 increase 1 stitch while staying in pattern = 75 stitches. Round 1 – *Slip 1 as if to knit, K2, psso both knit stitches, P2*; rep from * to end. Round 2 - *K1, YO, K1, P2*; rep from * to end. Round 3 - *K3, P2*; rep from * to end. Repeat these 4 rounds for a total of 8 repeats (32 rows) or until hat is approximately 1 ½ inches shorter than total desired length. Begin decreases; switching to double pointed needles as necessary. Round 1 – *K3, K2tog*; rep from * to end. Round 3 - *K2, K2tog*; rep from * to end. Round 5 - *K1, K2tog*; rep from * to end. Thread yarn through remaining stitches and pull tight. Weave in ends. Copyright © 2008 Toque Du Jour Designs. This material may not be reprinted without the permission of the author; this pattern may not be used to produce items for commercial purpose. Very pretty and I think the color is nice! Welcome back to the blogosphere. Hope things start to work out soon! My vet (aka The Cat Whisperer) has assured me that Fancy Feast is not worth the price and made me feel quite guilty about the serving thereof. Now The Big Fluffy Kitty hates me because she loved The Feast. She does not love the food the vet wants her to eat. Very nice beanie; I think I'll have to put that on my list of hats to knit! I hope all works out on the employment front! I'm glad your kitty is ok. Mine has a bladder infection right now and is so pitiful! what is psso in the pattern? thank you. its a cute hat. ! Love the beanie, I think I have just the yarn to make it for my teenage girl-- of course then she'll decimate my yarn making them for her friends and I'll have to buy MORE YARN!! and my husband will just shake his head and sigh. I love this pattern! I knitted it in blue variegated yarn and it looks great!I used size 8 to do ribbing and the I used size 11 needles to make the body more open and stretchy and it turned out great! 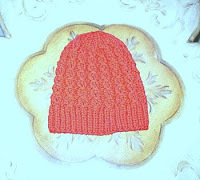 I will be making be making this hat again! Just your typical middle aged woman obsessed with knitting. Two cats, one fish, 8 rats (yes, you read that right) too much yarn and too many books stacked on the floor. The excitement is killing me.